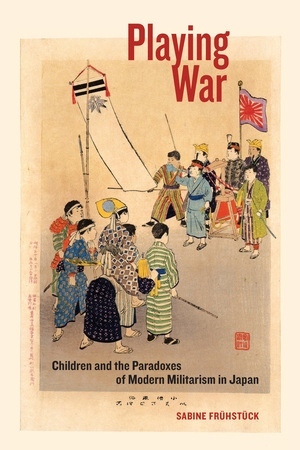 In Playing War, Sabine Frühstück makes a bold proposition: that for over a century throughout Japan and beyond, children and concepts of childhood have been appropriated as tools for decidedly unchildlike purposes: to validate, moralize, humanize, and naturalize war, and to sentimentalize peace. She argues that modern conceptions of war insist on and exploit a specific and static notion of the child: that the child, though the embodiment of vulnerability and innocence, nonetheless possesses an inherent will to war, and that this seemingly contradictory creature demonstrates what it means to be human. In examining the intersection of children/childhood with war/military, Frühstück identifies the insidious factors perpetuating this alliance, thus rethinking the very foundations of modern militarism. She interrogates how essentialist notions of both childhood and war have been productively intertwined; how assumptions about childhood and war have converged; and how children and childhood have worked as symbolic constructions and powerful rhetorical tools, particularly in the decades between the nation- and empire-building efforts of the late-nineteenth and early twentieth centuries up to the uneven manifestations of globalization at the beginning of the twenty-first.